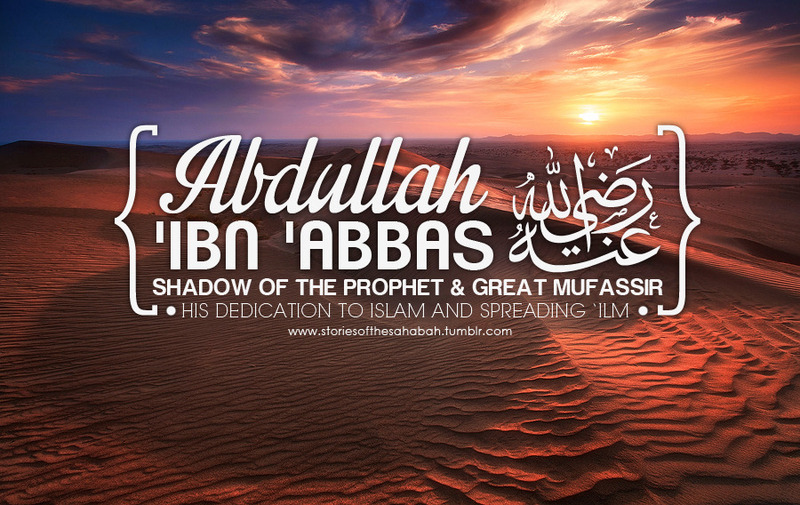 Wahab bin Munabbah says: "Abdullah bin Abbaslost his eyesight in his old age. I once led him to the Haram in Makkah, where he heard a group of people exchanging hot words among themselves. He asked me to lead him to them. He greeted them with 'Assalamu Alaikum.' They requested him to sit down, but he refused and said: 'May I tell you about people whom Allahholds in high esteem? These are those whom His fear has driven to absolute silence, even though they are neither helpless nor dumb. Rather they are possessors of eloquent speech and have power to speak and sense to understand. But constant glorification of Allah'sname has so over-powered their wits that their hearts are overawed and their lips sealed. When they get established in this state, they hasten towards righteousness. Where have you people deviated from this course? After this reprimand, I never saw an assembly of even two persons in the Haram." It is said that Hadhrat Ibne Abbasused to weep so much with Allah's fear that the tears streaming down his cheeks had left permanent marks on them. four hours of a day at one's disposal, to spiritual meditation? This masjid (mosque) in Taif houses the tomb of Abdullah bin Abbas (may Allah be pleased with him), the paternal cousin of the Prophet (peace and blessings of Allah be on him). He is revered by Muslims for his knowledge and was an expert in Tafsir (exegesis of the Quran), as well as an authority on the Islamic Sunnah (the practice of the Prophet (peace and blessings of Allah be on him). Abdullah bin Abbas (may Allah be pleased with him) was the son of Abbas (may Allah be pleased with him), the paternal uncle of the Prophet (peace and blessings of Allah be on him). His mother was Umm al-Fadl, the sister of Maymoonah (may Allah be pleased with her) [one of the wives of the Prophet (peace and blessings of Allah be on him)]. He was born around three years before the Hijrah. When he was born his mother took him to the Prophet (peace and blessings of Allah be on him) before he had begun to suckle. The Prophet (peace and blessings of Allah be on him) put some of his saliva on the newborn’s tongue, and that was the beginning of the close relationship between the two. While growing up, he was by the Prophet’s (peace and blessings of Allah be on him) side doing different services like fetching water for ablution. He would pray with the Prophet (peace and blessings of Allah be on him) and join his assemblies, journeys and expeditions. The Prophet (peace and blessings of Allah be on him) would draw him close, pat him on the shoulder and pray, “O Lord, make him acquire a deep understanding of the religion of Islam, and instruct him in the meaning and interpretation of matters.” Ibn Abbas (may Allah be pleased with him) narrated, “The Messenger of Allah wiped my chest and said ‘O Lord, grant him wisdom.’” Ibn Abbas (may Allah be pleased with him) devoted his life to the pursuit of learning and knowledge, following the Prophet (peace and blessings of Allah be on him) and memorizing his teachings.